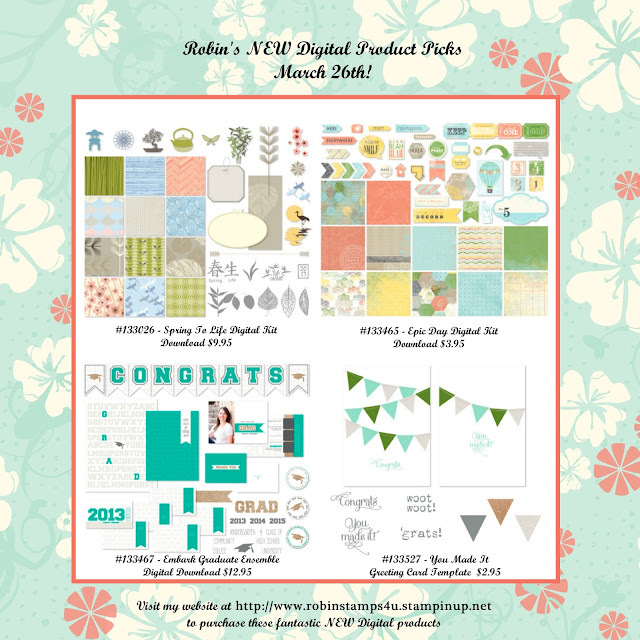 Trinity Designs: Fun New Digital Products! Do you know what I LOVE about Stampin' Up!? Well, besides EVERYTHING that is? LOL! It's because every Tuesday, they release NEW artwork for us to use in My Digital Studio (MDS). Yep, something NEW every week! Did you know that your Digital artwork will never retire? Yep, once you download it, you have access to all that artwork - for EVER! So, if a stamp set retires from the Idea Book and Catalog - no problem! If it's been released in MDS, then you can always print out the images you need - and size them specifically for your projects. If your favorite color goes bye-bye, you can still print your projects using THAT color! And even if you don't own and use My Digital Studio software, you can still use this exclusive downloadable art in your photo editing software. But why wouldn't you want to own My Digital Studio? You can get it in a download format OR on a disc. It comes with over $500.00 in digital content. There is a website dedicated JUST to My Digital Studio that's filled with how-to videos and tutorials for EVERY skill level. It also has a huge gallery of samples for you to browse and be inspired by! I created this photo collage in My Digital Studio! Pretty stinkin' cool if you ask me. Visit my Online Store to check it out and see all that's available to you in the world of MDS. Simply click the SHOP NOW button at the top right corner then click the My Digital Studio link in the left column. I hope you are able to get crafty today. If you do, make something FUN!